First published on the portlandtribune.com, COURTESY: OFFICE 52 ARCHITECTURE - The 64,000-square-foot Willie and Donald Tykeson Hall, currently under construction in the historic district of the University of Oregons Eugene campus, will create a center where students can connect with advisory and career services. For years, the University of Oregon's College of Arts and Sciences' programs and services have been spread across the school's Eugene campus. But then administrators decided it was time to create a central location to provide a focused roster of support services. Slated to be completed this summer, the 64,000-square-foot Willie and Donald Tykeson Hall represents what may be a first-of-its kind approach in the world of higher education. In addition to flexible classroom and lecture areas, the building will contain space for administrative and advisory services, counseling and tutoring, offices, and shared meeting rooms. The goal is to provide students enrolled in the university's liberal arts programs with more than just the specific skills necessary to excel in their chosen degree areas. The services in the new building also will ensure students have a solid foundation of the "soft" skills such as communication, creative thinking and problem solving that employers say they're having trouble finding in job candidates. "From the very beginning we'll he helping ... students understand there's a suite of career skills they need to be thinking about," said Andrew Marcus, who developed the new approach while serving as the Tykeson Dean of the arts and sciences college. "Having this integrated career and academic advisory (approach) from day one ... will help students understand they are building a portfolio beyond college." 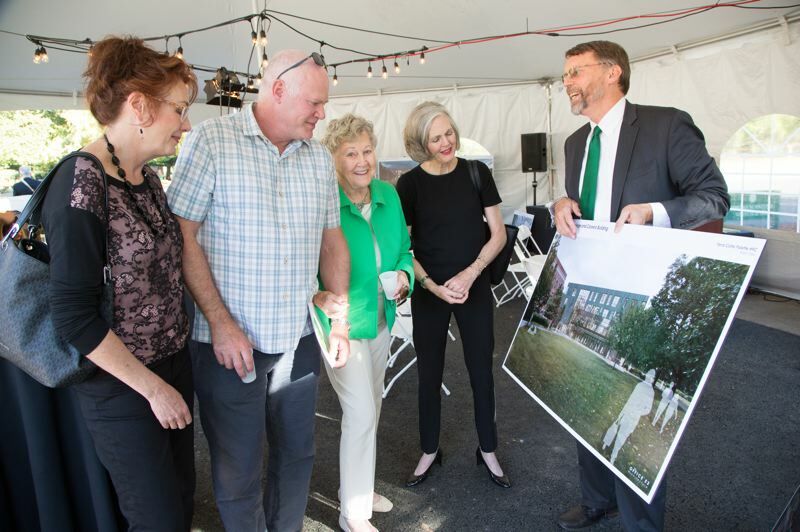 COURTESY: KELLY JAMES - Andrew Marcus, right, shows the family of the late Donald Tykeson a rendering of the 64,000-square-foot build that will be named in honor of the telecommunications pioneer and his wife, Willie, center. The $31 million building where those services will be located, which is slated to open in the fall, will be named after Donald Tykeson and his wife, Willie. Donald was a Eugene broadcasting pioneer and a founding board member of C-SPAN. The couple donated $10 million to the project before he died in July 2017. "The University of Oregon is going way further than any other school as far as bringing all of the academic aspects together," said Isaac Campbell, principal of OFFICE 52 Architecture, the Portland firm that designed Tykeson Hall. Even though OFFICE 52 is a small firm with just 10 employees — including Campbell and his partner, principal Michelle LaFoe — the firm had earned a big reputation in the world of higher education design even before its selection for the UO project. Campbell and LaFoe started OFFICE 52 in 2010. The two architects had always wanted to work together, and they found they both were ready for a change that would allow them greater choice in the types of projects they worked on. "We wanted to focus on what we were really good at," Campbell said. The partners also decided to keep the firm small so that, along with running the business they would have a chance to be hands-on when it came to actually working on projects. The firm already had several modest-sized projects to its name when it received an invitation to participate in a competition to design Scott Hall, a 109,000-square-foot building that serves as the home of the nano-bio-energy technology program in Carnegie Mellon University's College of Engineering in Pittsburgh, Pennsylvania. Campbell, LaFoe and their team looked at what Carnegie Mellon administrators were considering when it came to siting the building. The Office 52 team felt there was a better solution, and used that as the basis of their presentation. "Our entire proposal was a complete rethinking and that won it for us," Campbell said. The finished building, which features a unique exterior of dichroic glass, has since gone on to win several awards, including a recent honor from Gray magazine. The success of its work on the Carnegie Mellon project has opened doors for OFFICE 52. However, because the entire staff tends to collaborate on projects, the firm is careful about the work it pursues. The Tykeson Hall project caught the team's interest because it represented a new direction for the University of Oregon, a willingness to think outside the box that Campbell felt meshed well with the OFFICE 52 approach to designing projects. Tykeson Hall sits on an L-shaped site that formerly served as a surface parking lot in the heart of the campus' historic district, which is composed of buildings built in the early 20th century, up to the 1930s. University administrators originally planned to have the building follow the shape of the property. The OFFICE 52 team, working with Rowell Brokaw Architects as the architect of record proposed a smaller footprint for the building, which would then allow the area in front of the building to be turned into greenspace. 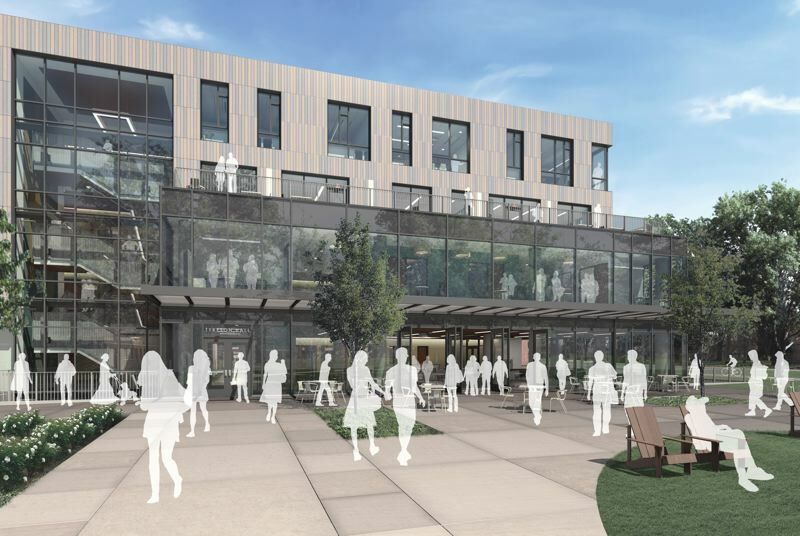 The area also would provide a connection to nearby Chapman Hall, which houses UO's Honors programs. An 80-year-old brick structure, Chapman boasts details made of terra cotta, the last time that material was used on a building on the campus. 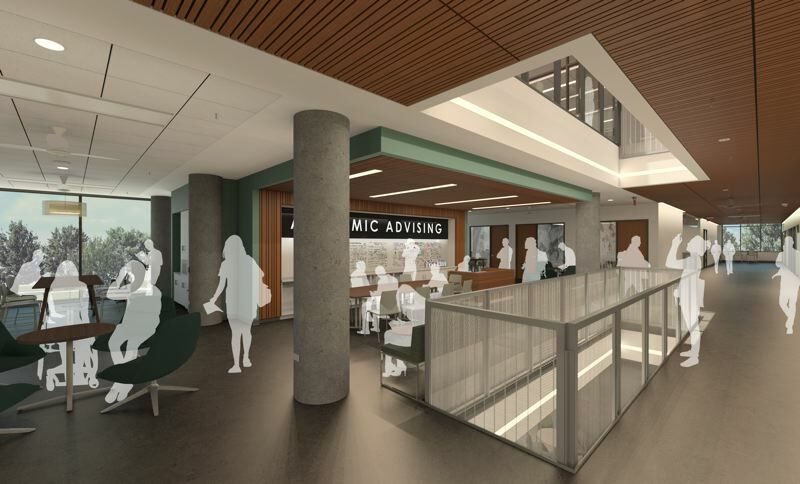 COURTESY: OFFICE 52 ARCHITECTURE - The upper central floors of Tykeson Hall will contain counseling and advisory services while the lower floor will feature The Commons, an event area that will open onto an exterior green space. University administrators were set on having the new building also be made of brick. Campbell and his team, however suggested minimizing the amount of brick on the exterior of Tykeson Hall in favor of using terra cotta as the main exterior material. "Terra cotta has been used (in the past) on campus buildings as a decorative element, (but we) used it as a primary material and as a rain screen," Campbell said. "It's a new interpretation that parallels the university creating a new way of approaching education." The main four-story portion of the building will house administrative and support services. The terra cotta exterior features a muted palette of five glazes in hues simultaneously drawn from the tones of terra cotta details on surrounding buildings as well as from a careful study of colors from the Oregon landscape, according to Campbell. "The terra cotta portion houses all of these disparate pieces that are being brought together and are being restructured and rethought in a new way," he added. "It's a new material for a new program." Stretches of glass on the main part of the building also offer views into public gathering areas and an event space that will be called The Commons. "The Commons ... is a space that flows out onto the terrace on the west side of the lawn," Campbell said. "It's meant to be transparent and open, and invites people into the building." The design team didn't completely bypass the use of brick, though. In order to create a smooth transition between the four-story main part of Tykeson Hall and the shorter Chapman Hall, a two-story brick portion that will house offices and classrooms runs along the outside of the new building. With an eye toward continuing the balance between old and new, OFFICE 52 developed a unique pattern for the brick that Campbell calls Norman Cross Bond. COURTESY: OFFICE 52 ARCHITECTURE - The exterior of Tykeson Hall features a five-color glaze palette of terra cotta, left, along with a unique brick pattern that was developed by OFFICE 52 Architecture. "As far as I know, it's never been done this way," he said. "It's a repeating pattern acknowledging everything else on campus, but we're doing it in a modern way. The 78,000 bricks, made from clay and shale from Oregon and Washington, were fabricated locally. The building also will feature a slat ceiling and wall panels in main public spaces made from Pin Oak trees harvested from the project site. Some custom furniture also is being made from Port Orford Cedar trees from the site. Additional custom-made furniture will feature materials certified by the Forest Stewardship Council. The project, which is targeting gold-level certification in the U.S. Green Building Council's Leadership in Energy and Environmental Design program, is expected to use 34 percent less energy than outlined by Oregon's energy code. The building is being billed as the first in the Pacific Northwest to combine post-tensioned concrete slab construction with a hydronic system. The highly efficient system features hydronic radiant floor and wall heating and cooling systems with active chilled beams. Fortis Construction is on target to finish the project by this summer, roughly two years after work on the building began. 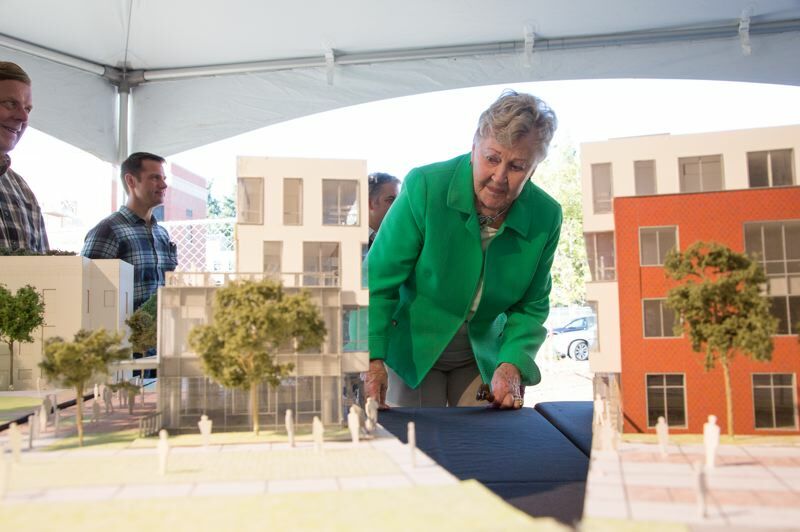 COURTESY: KELLY JAMES - Willie Tykeson examines a model of Tykeson Hall during the 2017 groundbreaking of the project. Tykeson and her late husband, Donald, contributed $10 million toward construction of the $34 million building. Meanwhile, the university is already beginning to ramp up the staff it will need to start introducing students to concentrated services that will be in the new building in the fall. The majority of the university's 21,000 undergraduates will be required to participate in the new program, Marcus said. Although specifics about how soft skills such as independent thinking and strong communication will be incorporated into basic classes such as math and composition are still being developed, the university has already begun beefing up its current staff of seven advisors with 23 additional positions, who will begin working with students in the new program this fall. Marcus, who retired from his position as a dean and now is a professor of geography at UO, already has talked with leaders at other universities from around the country who are eager to see how the new approach at Tykeson Hall will pan out. "I think there are going to be a lot of positive ripples from it," Marcus said. "I think it's going to be transformational for the students. I think it will be a place that will provide inspiration for other (universities)."